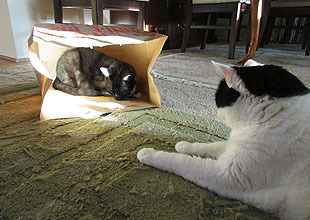 On the left, Inkblot is entranced by a paper bag. Why? Is it because it was once full of takeout food from El Cholo, so it smelled inviting? No. It’s because Domino had taken up residence in its lovely, aromatic interior. This all went pear shaped a few minutes after I took this picture, and I really wish I’d still had the camera handy so I could have shot a video for you all. Basically, Inkblot kept inching closer to the bag until Domino had had enough, at which point she started hissing and batting at the bag. 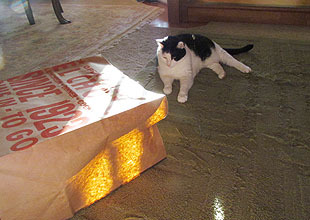 Every time she did, the bag made a sudden crinkling sound and Inkblot jumped out of skin. This continued for quite a while, with Inkblot never quite working up the courage to take a swat at Domino. He just kept poking his nose forward, and then suddenly jumping back, over and over and over. Words don’t do it justice, but it probably wouldn’t have played well on the campaign trail anyway. It was not his finest moment.